Wow, if you cylinder head covers weren't damaged..same again. Wunderlich also has a nice looking set in aluminum at their usual premium price. Friend has the ones for the R1100S on his bike and they are very well made. Being able to ride back home was worth it though. I even continued on with my ride. Good point. I've also seen JB weld and aluminum can repairs which worked well enough. I had some Wunder-or-other aluminium guards on my R and had a slide. I'm a big fan of the Machineartmoto guards, so...+1. They seem to be hard plastic molded over a chromed steel frame and are not obtrusive. There looks to be about a uniform 1/8" air gap between them and the heads. No slides so far, thank you, but a couple of garage/parking lot tip-overs and they did their job perfectly. I'd think they could handle much more but would rather not be the one to report on that. Not that it would necessarily make a difference, but I use different mounting hardware on my MotoMachine guards. Referencing above depiction, for the forward mount I use a more robust (head) chrome bolt and larger 15 mm washer (same as at the rear). I also make sure as best as possible not to load up tension on the guard at any particular mount. Glad to see your VC was not marred in the tip-over, Mike. Never seen that before. You should contact MAM and show them. Here's my three cents. 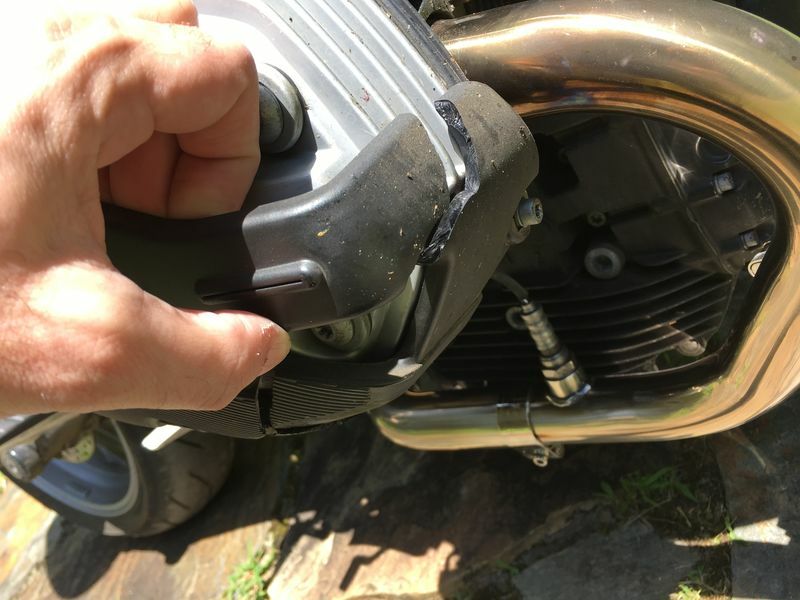 A slide will likely cause less damage to the valve covers than a straight fall over of the motorcycle. 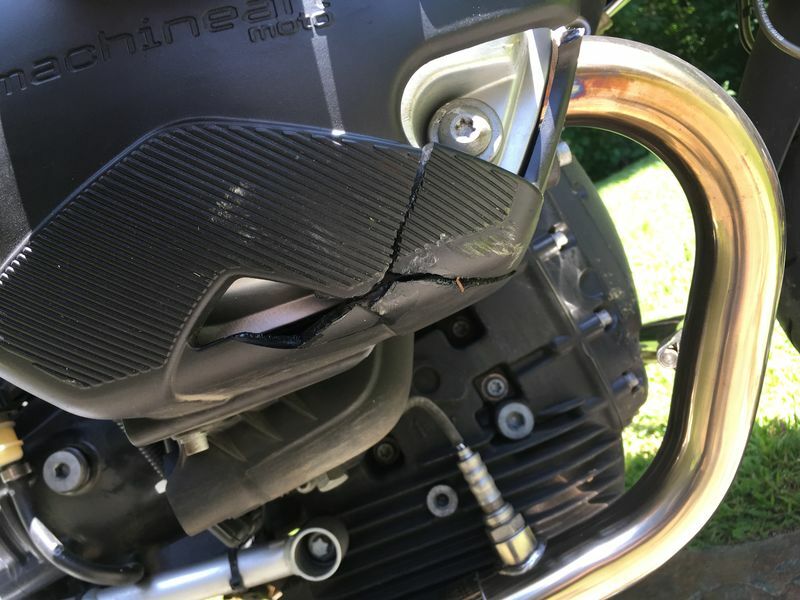 When the motorcycle falls over the protector recieves an impact all at once and is more likley to fracture or break. In a slide the impact is not as great and the damage is different to the protector. Your photos show this. But keep in mind you have the protectors to do just that, protect the valve covers and associated engine components. So, I think about any valve cover protector is just fine. I dropped a bike once and the protector broke but what it was protecting was fine; in a slide it'll get severly abraded but still will do what it was designed for. I have a set of the factory cylinder guards which I will gladly ship to you at no charge. 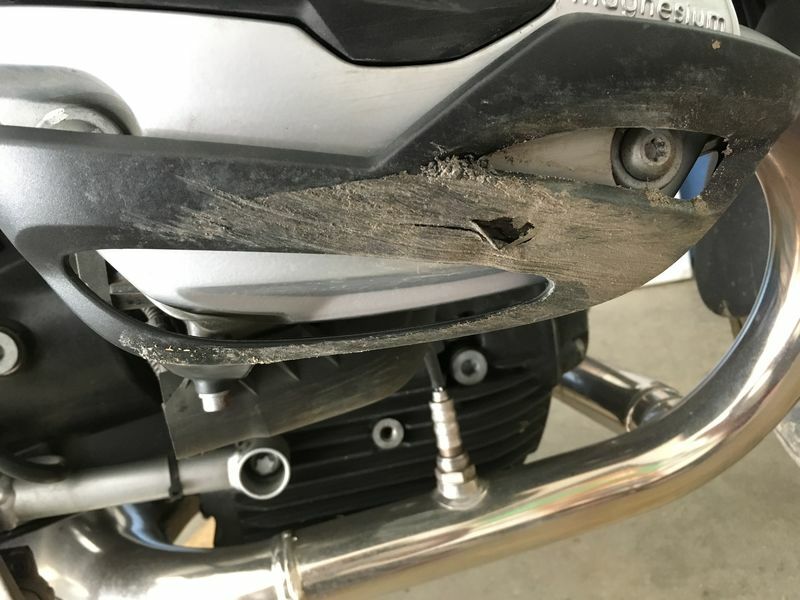 Currently I have a set of carbon fiber guards installed which have a thick shock absorbing puck to spread the load to a larger surface area of the cover should the bike land on the cylinder. I am trying to recall where I purchased them. If you shoot me a current email I will send pics of the set I have installed on my black and blue R1216$. These seem more expensive than the ones I bought but these are similar to the cylinder guards my R12S is wearing. Thanks Kurt. How's it going? I should have waited but I already had bought a set. These seem more explosive than the ones I bought but these are similar to the cylinder guards my R12S is wearing.